Tiny pieces of plastic or fibers, known as Micro-plastics, may act as a pathway for persistent, bio accumulating and toxic substances entering the food chain, and are increasingly being found in the oceans and may prove to be as harmful to marine life as more obvious, larger debris, such as plastic bags, according to a new report. The report, Sources, fates and effects of microplastics in the marine environment - a global assessment, has been published by the Joint Group of Experts on the Scientific Aspects of Marine Environmental Protection (GESAMP), an advisory body that advises the United Nations (UN) system on the scientific aspects of marine environmental protection. “While there is a need for further assessment of the problem, the report is the first attempt, at a global scale, to identify the main sources, fate and effects of microplastics in the ocean and offers improved understanding of the scale of the problem. The assessment suggests that there needs to be a wider awareness of the potential harm that microplastics in the oceans could cause,” said Dr. Stefan Micallef, Director Marine Environment Division, at the International Maritime Organization (IMO), the Administrative Secretary of GESAMP. “Even tiny particles, such as those used in cosmetic products or abrasives, could potentially harm marine life if ingested. We need to work globally to ensure that plastics do not end up in the oceans,” Dr. Micallef said. 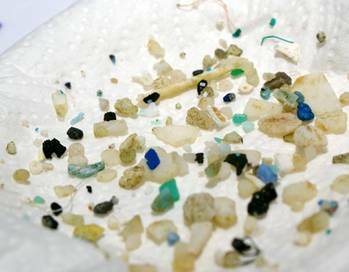 Microplastics refer to small plastic particles, less than 5 mm in diameter, but some as small as 10 nanometres. Microplastics may be purposefully manufactured for particular industrial or domestic applications (such as facial cleansers), or result from the fragmentation of larger items, especially when exposed to sunlight. Microplastics have been found distributed throughout the world’s oceans, on shorelines, in surface waters and seabed sediments, from the Arctic to Antarctic. They may accumulate at remote locations such as mid-ocean gyres, as well as close to population centers, shipping routes and other major sources. The potential problems of micro-plastics in the marine environment were brought to the attention of GESAMP in 2010 and the assessment report has been developed by a working group of experts which has met regularly during the past five years. The report notes that while the physical impacts of larger litter items, such as plastic bags and fishing nets, have been demonstrated, it is much more difficult to attribute physical impacts of microplastics. Nonetheless, laboratory tests indicate that even very tiny particles can cause cellular damage in mammals. Microplastics have been found inside the bodies of a wide variety of marine organisms including invertebrates, fish, birds and mammals, and the ingestion of microplastics may have an effect on the feeding, movement, growth and breeding success of the host organism. Plastics often contain chemicals added during manufacture and can absorb and concentrate contaminants such as pesticides from the surrounding seawater and there is emerging evidence of transfer of chemicals from ingested plastics into tissues. The report recommends better control of the sources of plastic waste, through applying the principles of the “3 Rs” (Reduce, Re-use, Recycle), and improving the overall management of plastics as the most efficient and cost-effective way of reducing the quantity of plastic objects and microplastic particles accumulating in the ocean. The report warns that even if all releases of plastic to the environment were to cease immediately, the number of microplastics in the ocean would be expected to continue to increase as a result of continuing fragmentation. future assessments should address the chemical risk posed by ingested microplastics in greater depth. GESAMP will continue to further develop knowledge on microplastics in the marine environment. Labels: Impacts on Marine Life, Microplastics, Plastic Pollution, What Can You Do?